The Investec Specialist Bank “Dash” Handicap takes place this weekend as part of the Epson Derby festivities. An interesting and balanced field takes the course this time out. Among the favourites, Duke Of Firenze is currently being billed as the leader in the betting markets, but with Captain Dunne and Long Awaited in the mix, the Duke will not have everything his way for this five-furlong sprint. Last year’s winner, Stone Of Folca, is also in the race, this year starting off at 12s. 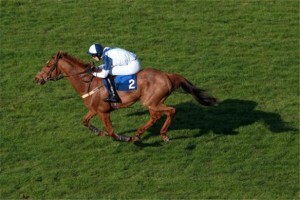 The best place to have a bet on the 2013 Investec Specialist Bank “Dash” Handicap is with Bet365.com. The odds below were taken from the site, and you will be able to find the latest race odds there as well. Bet365.com is also offering each-way betting on the race, with which you will receive 1/4 if should your selection place in positions one to four. Stone Of Folca provided a major shock last year in winning the race, and, maybe based on last year’s performance, comes into the race at 12/1. It is difficult to see him winning the race again this year, as a competitive field will be at the starting gates alongside him. Race favourite Duke Of Firenze won well at Goodwood recently, and although he was beaten last time out, he was unfortunate in that race, and is being well supported for the Dash. Captain Dunne may very well be his biggest competition. He has run this race four times, winning in 2011, and although he lost by a large margin last year to Stone Of Folca, has dropped 10 lbs and came back very well on his return at Chester. The going for the race is expected to be Good to Soft for the race on Saturday. As mentioned above, the best racebook to place a bet on the 2013 Investec Specialist Bank “Dash” Handicap is Bet365.com, who will offer the best odds on the race. When visiting Bet365.com, click on ‘Horse Racing’ in the left sidebar and scroll down to the Antepost section of the page, where you will find the markets for this race and many more. The Investec Specialist Bank “Dash” Handicap is a Class 2 race for horses ages three years old and older, and is run at Epsom Downs over five furlongs. The race has a purse of GBP 100,000 and was won by Stone Of Folca in 2012.